First time I have bought a female German shepherd puppy a few days back. But i have noticed a abnormality on her face, Its left side ear is folded down, it never comes up and other one is on upward normal position. The pets shop man saying that it will be clear after few days. Is it right? Why one ear became like this? 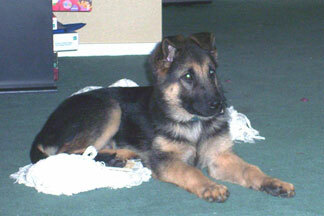 My Male shepherd when he was a baby his ears would flop down, first one ear would then the other, it was very cute but today his ears look just great. Now my female when she was a baby hers never did the same thing, so I don't think every shepherd goes through it, but it is quite common. So rest assured that your baby's ears will turn out just fine. this is not an abnormality. it will take several months maybe for the ears to stay up, both, and consistently. at least that is what i found with my female. some days they were both up, next day one and not the other etc, until she was after 6 months old at least. they are both up now and strong. people always comment on her ears and how nice and straight they are. just be patient.